The day the police came to Wanda’s house was the day she was rescued from a life of neglect. It started as a drug raid, but once the suspects were handcuffed and taken away, the police noticed a little cat – sick, underweight, and walking in circles on wobbly legs. Clearly she couldn’t be left behind, so they called for animal rescue right away. 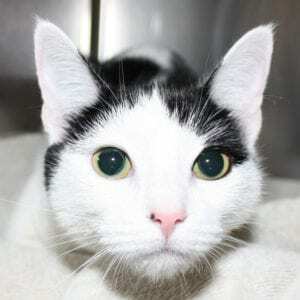 It was Wanda’s good fortune to arrive at Northeast Animal Shelter. We were afraid her wobbly walk might have been a result of ingesting toxic drugs. But on further examination, our veterinarian determined that the cause was cerebellar hypoplasia, a condition where the part of a cat’s brain that controls fine motor skills and coordination is underdeveloped at birth. Luckily, cats with this condition don’t realize anything is wrong with them – and for adopters who understand them, they can be wonderful pets. Due to serious neglect at her previous home, 8-year-old Wanda had other problems that required special care. Her teeth were in such bad shape that seven of them had to be removed. At that point, Wanda went on a hunger strike because it hurt to eat. We offered her the mushiest food possible and after a couple of days she began to empty her dish at every meal. Over time, she gained weight and her coat began to look thicker and glossier. She didn’t like being alone in a cage, so we moved her to a community cat room where her personality blossomed. We discovered that she loved to play with a tiny blue baseball tossed by a volunteer. When anyone whispered sweet words to her, she made happy feet on her blanket to show her delight. Wanda was super sweet and a very social kitty, but she was also a bit distrustful with strangers. It took some time, but when the perfect adopter arrived, the match was made in heaven. As a woman living alone, the adopter longed for a mature cat to curl up in her lap, a description that fit Wanda to a tee. What a journey Wanda made: from neglected drug-house leftover to beloved snuggle buddy! NEAS gave Wanda the new beginning she so richly deserved. Estrella and her three pups had been living in an outdoor pen before they were surrendered to Northeast Animal Shelter last fall. Fortunately, they arrived before the worst of a record-breaking cold snap. The puppies could never have survived a Massachusetts winter outside! With excellent medical care and good nutrition, mother and puppies flourished. Before long, they were all placed in warm, loving homes, but one little pup was returned to us a few months later. Brady, who was a very smart, sweet boy when he was adopted at 12 weeks old, developed some unwelcomed behavioral issues by the time he hit adolescence. 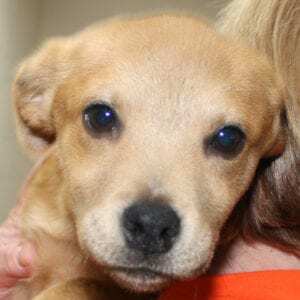 Brady is a Portuguese Podengo mix. These dogs are sight-hounds, and make wonderful companions, but they are very energetic and headstrong. They need to learn how to relax and enjoy being part of a human family. Despite his adopter’s commitment, she couldn’t give Brady the training and socialization he needed to fit in with her family. Upon his return to our Shelter, Brady went to a foster home for temporary care. We hoped his foster parents could help him develop the skills he needed to settle into a new home. Unfortunately, despite their best efforts, Brady’s foster parents could not deter Brady from his unruly behavior, so back he came to NEAS. Our staff readily accepted the “Brady challenge” and began to work with him every day. We weren’t going to stop until he became the social, well-behaved dog we knew he could be. We introduced Brady to a new world where he could relax, have fun, feel confident – and learn new manners. At NEAS, we identify the degree of a dog’s socialization by “Stages.” Brady started as a typical Stage 1 dog: unsure of his new surroundings and needing time to adapt to this change in his life. At Stage 1, we only ask that the dog learn to get along with a small number of friends who handle, walk, and care for him each day. Once he reached that goal, Brady moved right along to Stage 2 status. Now his world expanded as we allowed more human interaction. To graduate from Stage 2, Brady had to display his best manners with all the new people he met. Our staff worked with him diligently for months. Finally, Brady rose to the top, and at Stage 3, he was more than ready to show off his social skills to everyone. At last, Brady captured the hearts of a family visiting the Shelter. After months of hard work, he graduated with flying colors – and found the perfect family who adore him. We are so proud of Brady, especially because he had such a difficult start to life. He truly illustrates our belief that every pet should get a second chance – or even a third or fourth one if that’s what it takes! Charlotte Fournier was dedicated to helping anyone in need – she proudly worked for the Red Cross in the Korean War before earning her Master’s Degree and becoming a medical librarian. This independent, kind, and wonderful woman also loved animals of all kinds – especially her beloved feline family. We are so grateful Charlotte included the Shelter as a beneficiary of her estate, where her generosity will live on through the many animals we care for from her bequest. A gift to our no-kill Shelter helps us provide homeless pets with the life-saving care they need, so they can find the loving homes they deserve. Want to help Northeast Animal Shelter while you shop online? Try out AmazonSmile, a program from Amazon that allows you to support your favorite charitable organization with every purchase, at no extra cost to you. Just choose Northeast Animal Shelter at smile.amazon.com and help homeless pets whenever you shop!